When doctors need to see what’s happening inside your body, they often have you get a diagnostic imaging test. There are several types of these imaging tests that help the doctor make an accurate diagnosis and choose the ideal treatment plan. Each imaging test uses different technology to create images that help your doctor identify certain medical complications. Most individuals have had at least one medical imaging test. Three common types of imaging devices are x-rays, computed tomography (CT) scans and magnetic resonance imaging (MRIs) tests. Your physician may order one test or multiple tests. You might be anxious about having these tests performed, but diagnostic imaging scans are generally painless and non-invasive. Still, it can be helpful to get an understanding of how they each work and their common uses. Knowing the differences between x-rays, CT scans and MRI tests can help ease your mind when you know what to expect. X-rays are the most used diagnostic imaging test and are widely available. Even if you require more sophisticated body scans, it’s likely you’ll receive an x-ray first. They are a form of radiation, and when passing through your body, bone and other dense objects block the radiation and look white on the film of the x-ray. The less dense tissues are hard to see and appear gray. While limited exposure to radiation from x-rays isn’t harmful, if you’re pregnant, the doctor will take special precautions. The doctor will position the part of your body for scanning between the digital x-ray sensor or photographic film and x-ray machine. While the machine sends the radiation briefly through your body, you need to stay still. You’ll likely have positioning at several angles during your x-ray procedure. If you fractured only one limb, the doctor might want to take an x-ray of the limb not injured to compare both. X-ray sessions usually don’t take more than 10 minutes. The images are ready quickly. They’re usually written to a CD for a computer screen view or developed from x-ray film. In some circumstances, you might have a contrast dye injected into a joint while you’re getting x-rays. This procedure, also referred to as an “arthrogram,” helps outline the joint’s soft tissue structures. It might also help with needle placement into a joint when injecting medication or removing fluid. Images from x-rays might not be as detailed as those produced with sophisticated methods. However, they are the most used tool for evaluating an orthopedic issue and are usually available right there in the doctor’s office. Doctors often use x-ray scans for diagnosing broken bones. However, they have used them too for detecting types of cancer, pneumonia and other developing conditions. The x-ray’s length will depend on which part of the body the doctor is examining. However, it generally only takes a few minutes. There are two primary types of x-rays — soft and hard. Soft x-rays have fairly short wavelengths of approximately 10 nanometers (nanometers are one-billionth of a meter). Therefore they can be placed in the electromagnetic (EM) spectrum between gamma-rays and ultraviolet (UV) light. Hard x-rays have wavelengths of approximately 100 picometers (picometers are one-trillionth of a meter) wavelengths. They occupy the same area as gamma-rays on the EM spectrum. A CT scan generates high-quality, detailed images of the body. It’s a more powerful and sophisticated x-ray that takes a 360-degree image of the spine, vertebrae and internal organs. You may have a contrast dye injected into your blood so the doctor can see your body structures more clearly on the CT scan. CT scans are also used to detect tumors, and to evaluate lung or chest problems. A CT machine looks like a big box with a tunnel inside its center. You lie on a sliding table that slides you in and out of this tunnel as the machine rotates around you and produces cross-section images of your body. Your technologist performing the test will sit in a different room with computers that will display the images. They’ll speak to you using a microphone and speakers. CT scans are typically more expensive than x-rays and aren’t always readily available at rural or small hospitals. The PET CT scan helps the physician to see the level of activity of certain body organs and tissues, along with their structure. You’ll receive a substance called a “tracer” containing glucose with a little bit of radioactive material attached before your test. This tracer travels through your body systems. It acts like a dye for the imaging scan to pick up on. If there’s high chemical activity in certain areas, more of the dye will be picked up, and it will show bright spots on the image, alerting the doctor of possible disease. The radiation dose in the tracer is safe and minimal for most individuals. The tracer will be swallowed, inhaled or injected, depending on the examined body part. Physicians use PET scans often for detecting heart problems, cancer and brain diseases. CT urography is a type of specialized radiological exam used for evaluating the urinary tract, which includes the ureters, kidneys and bladder. It’s an innovative technology that uses computed tomography to produce cross-sectional images throughout your body. The images of internal organs are very detailed and allow doctors to make decisions on the most accurate treatment plan to take. The most common uses for this exam are to evaluate blood in your urine and detect kidney stones. MRI stands for magnetic resonance imaging and combines a strong magnet with radio waves. A computer operates the magnetic components, creating incredibly detailed images of body structures. The doctor views the images as “slices” or cross-sections of the scanned body part. Unlike x-rays, there’s no radiation involved. Doctors use MRI scans frequently for diagnosing joint and bone problems, as well as for assessing treatment progress, looking into brain abnormalities and evaluating pelvic pain or infertility issues. Open MRI: This refers to the configuration of the equipment. The Open MRI creates a bright imaging and a relatively roomy experience because it is open on three sides. It has a modern design which yields quick and comfortable exams, which is particularly beneficial for individuals who are claustrophobic. High-Field (1.5T): High-field (1.5T) is referring to image quality. The 1.5T offers a wide range of coil options, allowing for better image quality across some imaging applications when compared to the 3T. The bore refers to the opening in the MRI imaging machine. Short bore MRI scans are 5 percent wider and 50 percent shorter than the conventional MRI setup. The dimensions provide the patient with a roomy and very airy imaging experience. An open bore MRI provides a wider opening that allows for a far more comfortable MRI scan. With the traditional bore, there’s a slightly bigger opening than the patient, and this creates a very uncomfortable, restrictive environment. This high-field (1.5T) MRI scanning machine offers the most innovative imaging technology. It’s valuable for doctors to scan all body parts and is considered the industry standard. 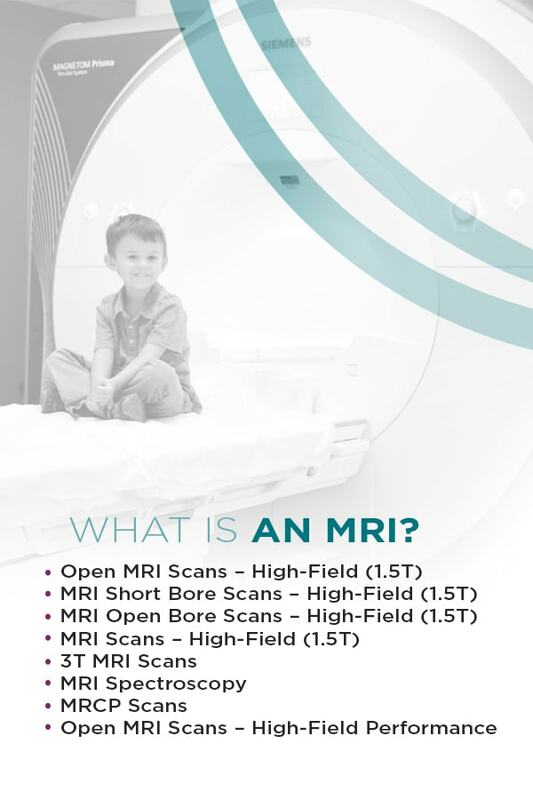 Also known as the 3 Tesla MRI, the 3T MRI scan is an efficient and powerful imaging exam that you may have instead of the 1.5T traditional scan. While 3T scanners were once only found mainly in medical research centers, these days, you may see them in clinical settings too. The 3T scans use strong, powerful magnets, producing a magnetic field much more powerful than the 1.5T scan. This allows the MRI to create clearer images more quickly. MRI spectroscopy is a non-invasive method used for characterizing the biochemistry of infarcts, tumors and other pathology. It’s frequently performed to diagnose specific metabolic disorders such as those that affect the brain. It helps doctors figure out the specifics of tumors like their metabolism or aggressiveness. Magnetic resonance cholangiopancreatography (MRCP) scan is a specific type of MRI that focuses on attaining images of the pancreatic and hepatobiliary systems, including the liver, gallbladder, pancreas, bile ducts and pancreatic duct. Open MRI scanners are systems that offer advanced magnetic resonance imaging abilities. They have various benefits and features. They provide panoramic views that come from all four sides. They also offer a comfortable, roomy experience. X-rays, MRIs and CT scans have a few similarities. All three are a type of imaging scan. You can have both x-rays and CT scans completed within minutes. All three imaging tools can be used to help with the diagnosis of one or more medical conditions. You need to remain still for all three tests according to the instructions given by the technologist. However, they also have several major differences. 1. What Is the Difference Between an X-Ray and a CT Scan? While the difference between CT scan and x-ray is minor, it’s also significant. Doctors use x-rays to detect dislocations and fractures of bones as well as detect cancers and pneumonia. However, CT scans are a type of advanced x-ray devices doctors use for diagnosing internal organ injuries, using x-ray images of the structure and a computer. X-ray machines in some cases fail to diagnose problems with muscle damage, soft tissues or other body organs, but with the CT scan, it’s entirely possible. x-ray images are in 2D, while CT scan images are 3D. The CT scanning machine rotates on an axis and takes various 2D images of an individual’s body from multiple angles. Then, the computer will place all the cross-sectional images together on its screen, resulting in a 3D image of the body’s inside, revealing the presence of injury or disease to the doctor. 2. What Is the Difference Between a CT Scan and an MRI? X-rays and CT scans both use a small dose of ionizing radiation to produce images. An MRI scan, however, doesn’t work this way. It uses powerful magnets and radio waves to create the images instead of ionizing radiation. So, you are not exposed to radiation when you have an MRI scan, unlike a CT scan or x-ray. The MRI applies a magnetic field, lining up each of the protons in your body. The radio waves are applied in short bursts to these protons, relaying a signal the MRI scanner picks up. Then the computer processes this signal and creates a 3D image of the examined body areas. The diagnostic images of a CT scan are taken typically quicker than an MRI scan. For instance, a CT scan, as with x-rays, often takes five minutes or less while MRIs can take 30 minutes or more. Doctors also use MRIs and CT scans for different reasons. A CT scan is very helpful in diagnosing severe injuries of the chest, head, spine or abdomen, particularly fractures. They’re also useful in pinpointing the location and size of tumors. An MRI, however, often does a better job at diagnosing problems in the joints, soft tissues, ligaments and tendons. Doctors will often order an MRI to scan the spine, brain, breasts, muscles, abdomen and neck. They’re an excellent tool for evaluating spinal ligaments. 3. What Is the Difference Between an MRI and an X-Ray? As mentioned, x-rays expose you to ionizing radiation. MRI machines don’t emit this radiation. x-rays take mere minutes while MRIs can take 30 minutes or longer — up to a couple of hours — depending on what the doctor is looking for. x-rays are limited to scanning for only a few body ailments. MRIs are more versatile, and doctors use them for examining many medical conditions. For example, x-rays are used more for examining broken bones, but they can also help detect diseased tissue. MRIs are better for evaluating soft tissues such as tendon and ligament injuries, brain tumors or spinal cord injuries. For more information or if you need to book an appointment for a CT scan, MRI or x-rays, call Envision Imaging. Our centers dedicate themselves to improving your well-being and health while providing outstanding hospitality and experience. We offer the latest in imaging technology to ensure you get reliable and accurate procedure results. We provide the fastest turnaround rate in the industry so your doctor can provide the quickest treatment plan possible for your urgent needs.